Now there is a way to cover surfaces and gaps between the boards at the same time. The Gap Wheel Stain Applicator is the fastest, easiest way to stain. Simply load the stain applicator pad with stain and cover the surface and gap in one-pass. The Gap Wheel: Spring loaded wheel drops 3/4" down in-between the boards to stain board edges. The Non-sticking Gap Wheel easily moves with applicator and climbs in and out of board gaps, no snagging or getting stuck. The Stain Applicator Pad: 1/4" inch flocked neoprene pad holds 3 oz. of stain, 300% more than a 4" brush or foam applicator. The flocked pad has 18,000 fibre/sq. inch allowing stain to be thoroughly worked into wood without streaking. Far better than brush results! 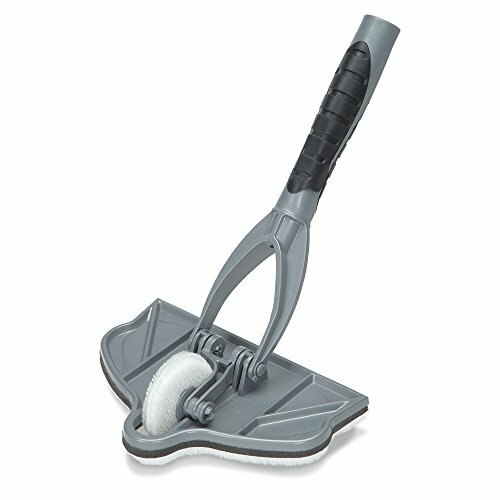 Stain applicator with Gap Wheel stains 16 feet in one fill, compared to 4 feet with a 4" brush. Stain Pad Adhesive is durable - no pad separation after soaking in mineral spirits for 8 hours. Stain pad backing is made of Neoprene which is a synthetic rubber that exhibits good chemical stability and maintains flexibility over a wide temperature range. Same material used in scuba suits. The Stain Applicator Handle: Pivoting handle can be attached to a pole for longer reach, Comfort grip handle and Adjustable handle bends down to fit under railings. Easy to use, just add stain. Load in standard tray. If you have any questions about this product by HomeRight, contact us by completing and submitting the form below. If you are looking for a specif part number, please include it with your message.